We all exist as part of a collective of dimensional lives. These dimensional lives are occurring concurrently with the life you are living now. Each of these lives is occurring in a dimension unique to them. So if you have 9 dimensional lives, these lives are occurring in 9 different dimensions. No one in this universe has the same dimensional collective as you – your dimensional collective is unique to you. Dimensional lives are often erroneously thought to be lives of an individual replayed across dimensions. Not so, each dimensional life in your collective, has a soul that is unique to them. Like you, their soul returns life after life to their dimension for all their lives. Each is a unique individual just as you are. They are separate from you. What makes you all part of a collective is that you all have the same Higher Self. A single Higher Self, up until the 5th initiation has many souls both in body and out of body. The Higher Self’s souls are in groups of 3. So you will have two beings in two other dimensions which are part of your trio and these will be closest to you energetically. These dimensional lives will occur as a total group of 3 (including you) or 6, or 9, 12, 15, 18, 21, 24, 27 etc. You are linked to your dimensional soul collective via your Core Star. This is the energy centre between your Solar Plexus chakra and the heart chakra. Its normal shape is oval. This energetic connection via the Core Star, between the Higher Self’s collective of lives, allows awareness and influence for these lives to occur across dimensions. Many of you are aware of your connection to a dimensional collective either via your dreams or a higher awareness. Do not confuse this soul collective with a soul group. What is commonly referred to as a soul group is the group of souls you reincarnate with life after life in this dimension; they are the ones that come to assist you in your life lessons. Also your soul mates and twin flames only occur in this dimension. Your dimensional lives have their own souls mates and twin flame in their dimension. So why does the Higher Self need to oversee a large group of souls? The Higher Self is ascending. He or she ascends via the ascension of it's soul collective. The Higher Self's soul collective experience every aspect of life and as they ascend into the light, the Higher Self awakens more and more to it's divinity. We all have a Christ Light (Monad, our own spark of God, our own personal god within). Our Christ Light has a lower self, which is our Higher Self. The main purpose of the Christ Light is to return to its point of creation as a Perfected Being. To become perfected, it utilises its lower self (our Higher Self). The Higher Self in turn utilises its own group of dimensional souls, across many dimensions on many worlds, to follow the cycle of rebirth and to ascend in consciousness and vibration and so finally, the dimensional souls can return to the Higher Self free of karma, with the lower 7 chakras perfected. All these lives/souls of a single Higher Self contribute to the ascension of the Higher Self. One of these souls will pass the 5th initiation first, and it will leave the cycle of rebirth first. This single person then has the sole and soul responsibility to assist in clearing all the karma of all the other dimensional lives, whether in body or not, of the Higher Self’s collective of souls. Part of the process of the adept moving from the 5th to 6th initiation is to clear the karma of all the dimensional lives through the adept’s perfected chakra system. The adept’s perfected chakra system allows karma to be cleared at a greater rate. The bonus prize for passing the 5th initiation first, is that you are the single physical body and soul that will become the anchor for the Higher Self at the 6th initiation. At the 6th initiation the Higher Self starts the descent into form. Your body becomes host to the Higher Self. When the karma is cleared from each individual dimensional life, that soul no longer contributes to the Higher Self’s ascension. The soul with all its past lives is taken back into the Being of the Higher Self, as part of the consciousness of the Higher Self. They become part of the greater being and in turn ascend into a greater collective consciousness thanks to the work of their dimensional brother of sister who passed the fifth initiation first. Can there be people here in this dimension – either on this planet or other planets who are part of my dimensional lives collective? No, the collective is multi-dimensional. In this dimension, across the entire universe, you are the only representative of your collective. Looking at our entire universe with all its planets, you start to get an idea now of the immense scale of dimensional lives and how many Higher Selves there must be. We have 6 billions people in body on this planet, so that's 6 billion Higher Selves to start with. Also think on this, only about 42 Ascended Masters stand with those on this entire planet as ray Masters, though hundreds more support humanity on a less personal level. Do twin flames have the same Higher Self? No, they are individuals with their own soul, own Higher Self and own Christ Light. I can see into the Fairy dimension – is this one of my dimensional lives? Perhaps, it just might be that it is an ability of yours to see this dimension, seeing doesn't mean you have a dimensional life there, though, I do know that some people in this dimension do have fairy dimensional lives, this is because they are of fairy origin. What is the role of the Ascended Master overseeing our dimensional lives? An Ascended Master is higher than a Higher Self in terms of Ascension (they have no more souls in body). Therefore the Dimensional life Ascended Master is not so much there for you, but there to assist the Higher Self with their lessons around soul management. I'm confused between dimensions and lives and what I read about the, 4th, 5th dimension and the planets ascension. Terminology! When you read about the 4th and 5th etc it is about ascension, it is about the raising of vibration, and by the raising of vibration the consciousness is raised. Dimensions and dimensional lives are different in that, they exist as realities for ascension. Think of our entire universe as a single dimension and within that reality, ascension is occurring. Is the Higher Self the same as the Divine Self? Again terminology can be conflicting and confusing. To me the answer is no – the Divine Self is the higher level and another name for the Christ Light, spark of God or Monad. 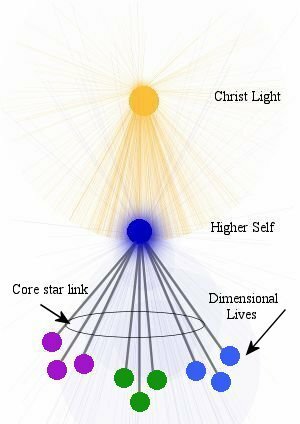 And as explained in the article, the Higher Self is ascending to the Christ Light. If one of my dimensional lives passes the 5th initiation before I do, will my life be terminated? The dimensional life that passes the 5th first will help clear any karma you have left and in doing this, your soul will be reclaimed by the Higher Self, your consciousness will become one with the Higher Self. You will have no more lives to live, because the dimensional life who passed the 5th initiation has helped you ascend into your Higher Self. With every past life, every time, when we die the personality drops away and the consciousness returns to the Higher Self. It is just the same, in the last life the consciousness becomes one with the Higher Self. All these dimensional lives become one with the Higher Self. Terminated is a harsh word, try Realised instead. Terminated suggests you are still thinking of yourself in terms of your humanity, not your Divinity. When the first soul passes the 5th initiation, and begins to clear the karma of the other dimensional lives, how is it done? When someone passes the 5th initiation, their 7 major chakras go into freefall and no longer function. The adept is now working only with the chakras 8-12. The adept now ascends chakra to chakra. The 8th chakra is now the major chakra for the 5th initiation and it is through this chakra the karma is cleared. Is there a connection among the soul rays of the dimensional trio I belong to? No, each life is separate and the soul ray pertains to each individuals soul lessons. Do the same trio of souls normally incarnate together? No the Higher Self can mix them up from life to life. They are not static. Is it possible to be aware of a dimensional life while awake? Yes, sometimes it is déjà vu, or a feeling of being ahead of yourself. Or you may get a glimpse into somewhere completely different. But for most people the awareness comes in dreams. Will this single 5th initiation soul become a guide to the other dimensional souls? No, because those souls now reside with the Higher Self. For those moving from the 4th initiation to the 5th initiation, is there a way to know their ascension is a result of their own efforts, or the efforts of a soul in their dimensional collective who has passed the 5th initiation? This assumes that karma is paid slowly by a person who has passed the 5th. It isn't. For those passing the 5th with us here at the portal we are finding karma is paid in weeks. If we add in the concept of twin flames – how does this work with dimensional souls? In the beginning, a single unit, separated into two Christ Lights, one being the Alpha Flame and the other being the Omega flame. Each of these Christ Lights has its own Higher Self. So we know these two Higher Selves are twin flames. These two Higher Selves have many dimensional lives. So we can say that when a life occurs in the same dimension from each Higher Self – then these two people are Twin Flames. Because their Higher Selves and Christ Lights are twin flames. How important are dimensional lives to my ascension? To your ascension - not very important at all. To the ascension of your Higher Self - they are the means of his/her ascension, so very important. Should I send healing to my dimensional lives? That is a personal choice, I suggest before the 5th initiation you heal yourself first and work on your own ascension, and then after the 5th initiation, you can help them the via your greater abilities. Explain what happened to the Masters dimensional lives please? The Ascended Master is the Higher Self. The Ascended Master has no dimensional lives in form. The Ascended Master is a vast being who holds within his being a collective of souls. These souls have no more karma left. These souls are no longer tied to returning into form. There is talk of Ascended Masters returning to earth. This is impossible as the Higher Self has no souls who are drawn to reincarnate as they have no karma left. There is no reason for this to occur. The closest approximation of this event is when the Higher Self enters the body of it's last remaining soul at the 6th initiation, for the purpose of it's own ascension process. Though while in body, the Higher Self because of who it is will seek to serve humanity.